We spend several hours a day on our smartphones. Have you ever wondered how this time affects us? The effect is clearly visible, and yet it is only the beginning, as more and more technology is being embedded in our everyday lives. Too often, technology is created with the goal of making things more efficient from a technical or commercial point of view, simultaneously ignoring our well-being. The amount of technology we use each day has been growing fast, and nowadays technology is present in all aspects of our lives. Ubiquitous computing was the first term to describe this concept of having computing power embedded everywhere around us, but the same concept has later been described with dozens of different terms, each having its own flavor, such as Pervasive Computing or Internet of Things. Ever-present technology, like mobile phones, allows us to connect with others and build relationships, but extensive use of mobile phones and social media can also have negative effects on mental and physical health. Not only academics, but also other influencers in the tech scene, such as the Center for Humane Technology, have been trying to raise awareness of how technology steals our attention. Further, many tech giants in Silicon Valley, including Facebook and Apple, have recently started to address the issues of ubiquitous technology and social media by rolling out features that allow users to control the time they spend in their apps. Business models resting on drawing the attention of users have dominated web-based companies since the beginning of Internet. With the rise of ubiquitous computing the effects of these business models have blended in our everyday lives resulting in different services fighting for our attention wherever we go. 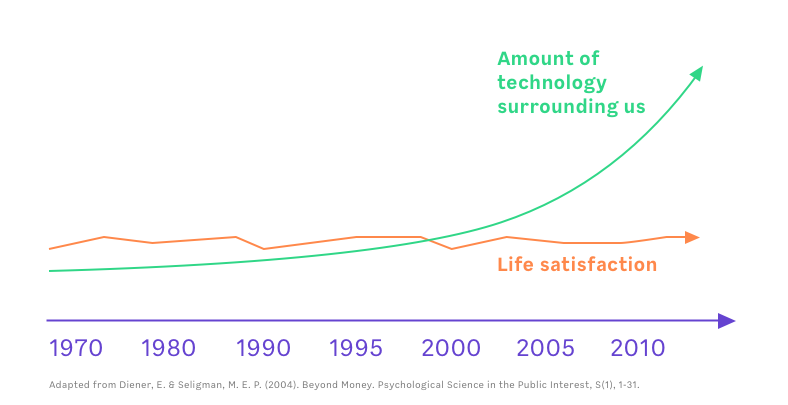 Although one would assume that technology is created to make our lives easier, and thus us happier, the average life satisfaction has remained more or less at the same level over the last 50 years. So, technology isn’t making us happier. At least not directly, and why is that? Insufficient knowledge or negligence of the effects of ubiquitous computing, like its ever-presence or invisibility, is affecting the users negatively. Ubiquitous computing is not inherently bad, in fact it opens doors to more intuitive and calm products and services. One of the reasons why ubiquitous computing has caused problems is the designers’ insufficient understanding of the influence of the ever-present technology on human mind and behavior. For example, the use of graphical user interfaces may not always be the best solution, such as is discussed by Golden Krishna in his book “No Interface is the Best Interface”. To avoid creating ubiquitous products and services that cause problems, we need to follow a user-centered design process and test our products with real users in real contexts. It seems likely that insufficient knowledge of the effects of some traits of ubiquitous products and services, like their omnipresence or invisibility, is causing challenges. The deeper technology will be embedded into our lives, the more prominent these challenges will be. We should understand the typical problems that ubiquitous computing may cause to users, and address them early in the design process. If we could avoid the typical challenges with ubiquitous products and services, we could create better products with a lower investment, as fewer iterations would be needed during the design process. Therefore, I have created a set of design principles that help us avoid these problems and create ubiquitous products and services with a better user experience. Specifically, the design principles are focused on user interfaces. Following these principles will not only create a better user experience, but will also guide us towards a healthier relationship with technology. Considering the pace at which the new technologies are being embedded in our surroundings, it will be more and more important to follow these principles. Here’s a quick review of the design principles for you to see what to consider when developing services with ubiquitous computing. A more detailed discussion of the design principles and some examples can be found here. Create a Natural Feeling Using a product that feels natural is effortless and graceful, which in the end results in happy users. In general, a system that (i) mirrors human capabilities, (ii) optimizes progress from novice to expert, (iii) can adjust itself to given contexts and tasks, and (iv) fulfils user needs, feels natural to the users. Support Activities and Implicit Interaction In order not to overload users, ubiquitous services and products need to be designed for the context of use to automatically support the natural behaviour of the users, and not only to execute individual tasks. This requires a deep understanding of the users, which can be acquired through research methods such as ethnographic studies and observations. Metaphors and Mental Models Products or services leveraging ubiquitous computing can suffer from invisibility, which is why suitable metaphors should be used to describe the product or service to the users and to create a correct mental model for the users. Think about Alexa and Siri, for example. The complicated technology needed to understand what you are saying is disguised behind a metaphor of a clever personal assistant. Visibility and User Guidance To feel natural, a product or service should have a user interface that gives proper feedback to the users and guides them with scaffolding. 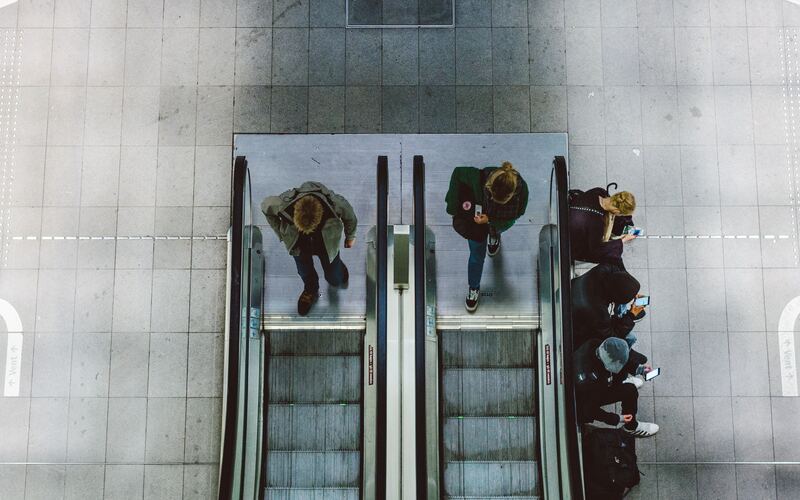 As ubiquitous computing applications embedded in the everyday surroundings may be hard for users to see and understand, discoverability of the product or service is important. Calm Technology Due to the physical presence of the product or service, it is important that designers create calm products or services that do not unnecessarily draw the attention of the users, and remain otherwise in the periphery of the attention. Designing with Data As ubiquitous computing applications often rely on different kinds of sensors, they typically have access to vast amounts of data. It is, however, important to show only actionable and meaningful data to the users so that the product or service remains calm. Physical Appearance It’s important to consider the physical appearance of the product or service leveraging ubiquitous computing, as interactions will increasingly be focused on physical objects and environments. Privacy and Ethics Ubiquitous computing and embedded technology often means that the product or service has access to personal data. Generally, if users do not fathom, there is a privacy problem. Users should have control over the product or service to manage privacy related aspects, but it is also the designers’ responsibility to take privacy into account, by for example deciding how user data is handled. Users should also be made aware of the presence of the products or services leveraging ubiquitous computing. I hope this post will help you to acquire a quick overview on what is important when designing novel ubiquitous computing applications that feel as natural as possible. If you find a certain topic area especially interesting, there is a lot more to read about each of them. You can start by reading my more detailed article.